In this note, convex Homotopy perturbation method (HPM) is presented for the approximate solution of the linear Fredholm-Volterra integral and integro-differential equation. Convergence and rate of convergence of the HPM are proved for both equations. Five numerical examples are provided to verify the validity and accuracy of the proposed method. Example reveals that HPM is very accurate and simple to implement for integral and integrodifferential equations. Integral equations occur naturally in many fields of science and engineering . A computational approach to solve integral equation is an essential work in scientific research. Fredholm and Volterra integral equation is one of the most important integral equations. Some iterative methods like Homotopy perturbation method (HPM) [2-11] and Adomian decomposition method (ADM) [12-14], Homotopy analysis method [15-22] have been applied to solve linear and nonlinear Fredholm and Volterra integral equations and integro-differential equations. Eqs. (1)-(2) are called Fredholm-Volterra integral equations (FVIEs) and Fredholm-Volterra integro-differential equations (FVIDEs) of the third kind respectively. For both type of equations the convergence of approximate solutions are established and four examples are provided to verify the accuracy of the proposed method. The paper is organized as follows. In Section 2, we present the application of the HPM for the problem (1) and proof of the convergence. In Section 3, HPM is modified to solve the Eq. (2) and present the rate of convergence of the approximate solution. Section 4 provides four examples: first two examples related to the Eq. (1) and another two more examples dealt with Eq. (2). Numerical results show that the proposed methods are very accurate and converge fast. Conclusion is given in Section 5.
where L ia a linear operator and N is nonlinear operator. This shows that H(u, p) continuously traces an implicitly defined curve from a starting point H(v0,0) to a solution H(u,1) . The embedding parameter p monotonically increases from zero to unit as the trivial problem F(v) = 0 is continuously deformed to the original problem L(u) + N(u) − f = 0 . The embedding parameter p∈(0,1] can be considered as an expanding parameter . The series (8) is convergent for most cases, and the rate of convergence depends on L(u) and N(u) . we solve the problem (1) as follows. For p = 0 the solution of the operator equation H(v,0) = 0 is equivalent to the solution of a trivial problem s(x)v(x) - u0(x) = 0 . For p = 1 the equation H(v,1) = 0 leads to the solution of Eq. (1). Where is satisfied and initial guess u0 is chosen as a function continuous on the interval [a,b] , then series solution (7) is uniformly convergent to the exact solution u on the interval [a,b] for each p = [0,1] . Proof. Prove of the Theorem 1 has not much changes of the Hetmaniok et al . [Theorem 1]. where is the standard norm in C[a,b] . The convergence of the approximate solution (7) of Eq. (2) is given in the Theorem 3..
where holds and the initial value u0 is chosen as continuous function, then the series in Eqs. (7) is uniformly convergent to the exact solutions u(x) in the sense of the C1 norm on the interval [a,b] for each p∈[0,1] . Since the the estimate series (??) is the geometric series with the common ratio β and therefore it is convergent if common ratio β < 1 . 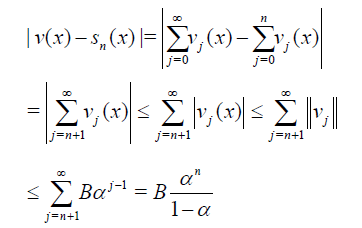 It implies that v(x) is uniformly convergent on [a,b] for each p∈[0,1] . is the convergent geometric series possessing the common ratio β < 1 . Hence, the solution v(x) is differentiable. So that both series (7) and (29) are convergent if | β |< 1 . Then according (17) we obtain convergence of the series (7) to the exact solutions u(x) in the sense of the C1 norm. The partial sum sn(x) in Eq. (16) and its derivative can be estimated as follows. Table 1 shows that the errors decreases very fast when number of terms n increases. Table 1: Errors of the approximate solutions sn (x) defined by (16) for Eq. (37). with the exact solution ud(x)=e-x . Parameter α in Eq. (38) satisfies the inequality (15). From the Table 2 it can be seen that the absolute and relative errors are decreased very fast when number of terms n increases. Table 2: Errors of the approximate solutions sn(x)defined by for Eq. (38). with the exact solution ud=x and initial condition u(0) = 0 . From these results we can conclude that the approximate solution converges very fast to the exact solution when n increases. satisfies the condition of Theorem 3. The results in Table 4, show that the absolute and relative errors of Eq. (40) decreases very fast with initial guess u0(x)=x+2 . From the Table 5, we can conclude that approximate solution for Eq. (41) would converges to the exact solution but it might depends on the choice of the initial guess. In this note, we have analyzed HPM for solving linear FVIEs and FVIDEs of the third kind. From the Theorem 2 it follows that HPM for FVIEs converges uniformly if α < 1 . Meanwhile, HPM for FVIDE is uniformly convergent and differentiable if β < 1 . Examples 1-2 corresponding Tables 1 and 2 verify that HPM is very accurate and stable for the FVIEs. Meanwhile Examples 3-4 show that HPM is convergent to the exact solution very fast when number of points n increases. Example 5, shows that convex HPM converges to the exact solution by the suitable choice of initial guess even though conditions of Theorem 2 is not satisfied. From the examples above, we can conclude that HPM method for solving FVIE and FVIDE converge very fast when number of point n increases and given functions and kernels are satisfied the certain conditions in thm1 and thm3. This work was supported by University Putra Malaysia under Fundamental Research Grant Scheme (FRGS, 2011). Project code is 01-12-10-989FR. Wazwaz AM. Linear and nonlinear integral equations: Methods and applications.Springer, New York, NY, USA, 2011. He JH. Homotopy perturbation technique. Comp Methods Appl Mech Engrg. 1999;178:257-262. He JH. A coupling method of a homotopy technique and a perturbation technique for non-linear problems, Int J Nonlinear Mech.2000;35:37-43. Khan Y. and WuQ. Homotopy perturbation transform method for nonlinear equations using He’s polynomials. Comp Math Appl. 2011;16:1963-1967. Madani M.et al. On coupling of the homotopy perturbation method and Laplace transformation. Math Comp Modelling. 2011; 53:1937-1945. Khan Y. et al. Coupling of homotopy and the variational approach for a conservative oscillator with strong odd-nonlinearity. Sci Iran. 2012;19:417-422. Ramos JI. Piecewise homotopy methods for nonlinear ordinary differential equations. Appl Math Comput. 2008;198:92-116. Jafari H. et al. Convergence of homotopy perturbation method for solving integral equations. Thai J Math. 2010;8:511-520. Golbabai A. and Javidi M. Application of He’s homotopy perturbation method for nth-order integro-differential equations. Appl Math Comput. 2007;190:1409-1416. Dehghan M.and Shakeri F. Solution of an integro-differential equation arising in oscillating magnetic fields using He’s Homotopy Perturbation Method. Progress in Electromagnetics Research PIER 78. 2008;36:1-376. Ghasemi M. et al. Numerical solution of the nonlinear Volterra-Fredholm integral equations by using Homotopy Perturbation Method. Appl Math Comput. 2007;188:446-449. AbbasbandyS.Numerical solutions of the integral equations: homotopy perturbation method and Adomian’s decomposition method. AppliedMathematics and Computation.2006;173:493–500. Abbasbandy S. and Shivanian E. A new analytical technique to solve Fredholm’s integral equations. Numerical Algorithms.2011;56:27–43. Babolian E. et al.The decomposition method applied to systems of Fredholm integral equations of the second kind. Applied Mathematics and Computation.2004;148:443–452. Liao SJ. The proposed homotopy analysis technique for the solution of nonlinear problems, PhD thesis. Shanghai Jiao Tong University. 1992. Liao SJ. Beyond perturbation: introduction to the homotopy analysis method. Boca Raton: Chapman and Hall/CRC Press; 2003. Liao SJ. On the analytic solution of magnetohydrodynamic flows of non-Newtonian fluids over a stretching sheet. J Fluid Mech 2003;488:189. Liao SJ. On the homotopy analysis method for nonlinear problems. Appl Math Comput 2004;147:499–513. Mustafa INC. On exact solution of Laplace equation with Dirichlet and Neumann boundary conditions by the homotopy analysis method. Phys Lett.2007;A 365:412–415. Abbasbandy S. et al. The homotopy analysis method for multiple solutions of nonlinear boundary value problems. Commun Nonlinear Sci Numer Simulat. 2009;14:3530–3536. Biazar J.andGhazvini H. Convergence of the Homotopy Perturbation Method for partial differential equations. Real World Appl. 2009;10:2633-2640. Biazar J.and Ghazvini H.Study of convergence of Homotopy Perturbation Method for systems of partial differential equations. Comput Math Appl. 2009;58:2221-2230. Hetmaniok E.et al. A study of the convergence of and error estimation for the homotopy perturbation method for the Volterra-Fredholm integral equations, Appl. Math. Lett. 26 2013 165-169. Silverman RA. Calculus with analytical geometry, Prentice-Hall publica-tion, New Jersey, 1985. Kythe PK. and Puri P. Computational Methods for Linear Integral Equations, Birkhäuser, Boston, 2002.